If you have ever worked with a designer or decorator, or shopped for a fabric from designer sources, you may have heard the term “hand” in reference to fabric. Read on to find out what this industry term means. The “hand” of a fabric refers to the “feel” of the fabric against your skin. There are many adjectives that can be used to describe the hand, or feel, of a fabric. Words like cool, slick, smooth, loose, stiff, heavy and stretchy can all be used to tell someone about the hand of a fabric. So, if your designer or fabric showroom representative says to you, “This fabric has a soft hand,” she is telling you that the feel of the fabric is soft. Why do we care about the hand of a fabric? 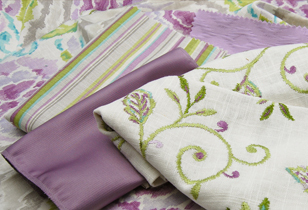 The hand is important to consider as you shop for a fabric for a particular purpose. For example, a fabric intended for use as a drapery fabric should have a softer, more supple hand than a fabric intended for upholstering a chair, which may have a heavier or stiffer hand. A stiff fabric doesn’t typically produce a gorgeous window treatment. You never want to select a fabric based solely on its appearance; always feel the fabric to ensure the hand is appropriate for its application. In addition, the hand of a fabric is important to note when it will be used on something that will touch people’s skin directly. Fabrics used to make bedding, to upholster furniture and even to make decorative pillows should have a pleasant hand – not something rough, sticky or irritating to the skin. If you use the term “hand” next time you are shopping for designer fabrics, I guarantee that you will look like a design-industry insider. 3 Responses to What Is the Hand of a Fabric?